According to Radio Free Asia, Fang Zheng, who lost both of his legs during the Tiananmen Massacre, has now acquired his driver license and is able to drive around by himself. Since arriving at America, Fang Zheng has received medical help which enabled him to stand up again and dance with his wife. Now he has gained yet another degree of personal freedom. 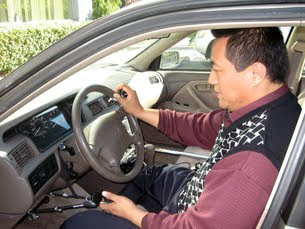 According to the report, the handicap car equipped with hand controls was donated to him by a Chinese student.